Definitive Environmental Reference from C.H.I.P.S. This encyclopedia provides information on the environment and its response to natural and human influences. 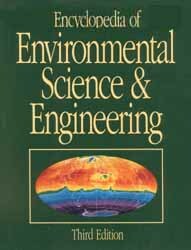 The Encyclopedia of Environmental Science and Engineering deals with the many aspects of environmental science and engineering, ranging from acid rain to zooplankton. In addition, there is much information presented concerning environmental problems and the various activies and technologies developed to solve them. This authoritative and comprehensive encyclopedia is an indispensable tool for anyone interested in developing an understanding of the complex and important aspects of environmental science. It is a reference work that will be useful to students and professionals alike.